CA residents add 7.75% State sales tax. 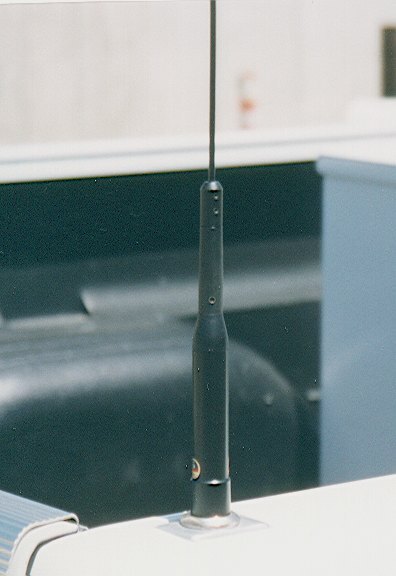 Our VHF-1 (SO-239) and VHF-2 (NMO) Geotool Pickup-Truck Antenna Mounts are designed for RG-8 MINI coaxial cable. A hollow, 9/16" diameter bolt attaches the mounts to the stake pocket on the bed of your truck. 9/16" washers are used to adjust the height of the mount. The coaxial cable is routed either out the front or rear of the stake pocket through any of several available openings, and then into the cab, by any of a number of commonly used techniques. Special coaxial cable connectors are available which will allow removal of the mount for installation of camper shells, etc. Watch the web page for details. Our standard GeoTool HF mount, with 3/8"x24 threads will accept Co-Linear antennas (Such as the Hustler CT-144) for single band use. These antennas have very high gain (5.1db for the CT-144), but are rather large and limited to one band. The standard mount can be also used with a number of popular HF antennas. Our Mounts now come in sizes that should fit most stake pockets. Some shimming of the top of the mount, using common plastic electrical tape, is required to stabilize the mount. Shimming materials are included which will allow minimal use of electrical tape for those stake pocket holes that are slightly larger. Our mounts are made to fit all variations of mount sizes, so they may be just a bit small for your stake pocket. It may be necessary to slightly enlarge the bolt hole in the bottom of the stake pocket to allow the 9/16" bolt to fit properly. This can be easily accomplished using a round file, or a drill. Some stake pockets do not have a 5/8" anchor bolt hole, and this must be drilled by the user. See the PDF version of our instructions for suggestions on drilling this hole. Our new mounts have 1/2" anchor bolts, but we are trying to sell the 9/16" anchor bolt versions first. Our mounts fit trucks with straight sided stake pockets. Tapered stake pockets, sometimes found in the center of long-bed trucks, will not allow the mount to enter properly. Be sure to check all dimensions carefully prior to ordering to ensure a proper fit. MOUNTS WILL FIT MOST PICKUP TRUCKS! MEASURE CAREFULLY BEFORE ORDERING TO BE SURE THE MOUNT WILL FIT! If the mount does not work for you, a full refund will be given, provided it is returned within 30 days, in an undamaged condition suitable for resale. The mount is guaranteed for 1 year against manufacturing defects. Defective parts will be replaced without charge, when the defective piece is returned. Price:$74.95 - (U.S. Dollars) - Shipping: $7.00 for one mount, $9.00 for two mounts. Contact us for shipping costs outside U.S. TERMS: Checks, money orders, American Express, Visa, and Mastercard. Credit card orders are handled as telephone orders. If you choose to send your credit card number by email, clearly note the BILLING ADDRESS for the card (including ZIP CODE), and EXPIRATION DATE of the card, the address where you wish the mount to be sent, and a telephone number where you can be reached. Most orders are now being shipped from stock on hand within 1 to 2 working days. For further information, please contact us via e-mail, telephone, or fax. We will generally be available to answer calls personally from about 6:00pm to 8:00pm, Pacific Time. Satisfaction is Guaranteed. If items are returned in a condition such that they can be resold, a full refund will be made. Unsolicited E-mail comments from users of the Mount! DIAMOND VHF and UHF ANTENNAS!